Amazon delivery drones made their debut appearance at the SXSW conference in Austin, Texas today. Two of the new Amazon delivery drones were on display during this weekend’s event, allowing SXSW visitors to see the new UAVs up close. 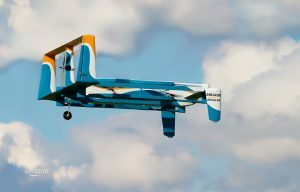 As you’ve probably heard, Amazon intends to use drones to deliver packages for their new delivery service, Amazon Prime Air. 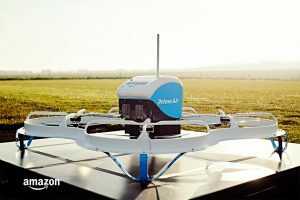 The service aims to use fully autonomous unmanned aerial vehicles to safely deliver packages to customers in 30 minutes or less. 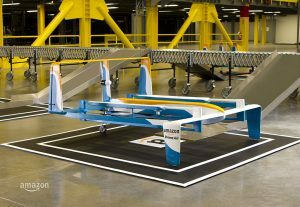 Amazon also has a hybrid drone it intends to use, this one with a horizontal bed to carry products. The new drones didn’t fly for spectators at SXSW, but were on display for close observation. Amazon has reached an agreement for drone use in the United Kingdom (at least for testing purposes), so the beta tests of the Prime Air Drone delivery services are being conducted there. 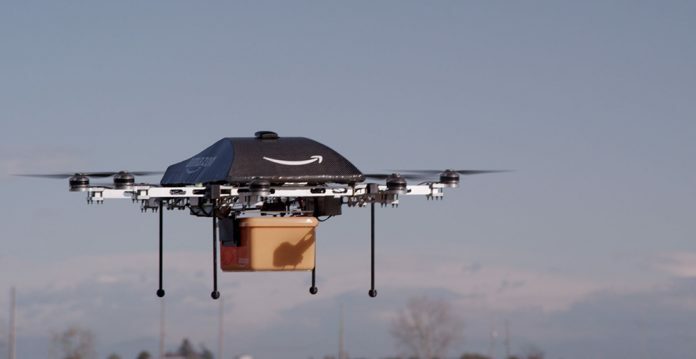 The use of delivery drones isn’t currently approved by the FAA, so Amazon has been unable to test the services in the United States. The current FAA regulations require a human pilot who maintains constant line of sight. Amazon, however, seems confident that the service will be able to launch in the US eventually.